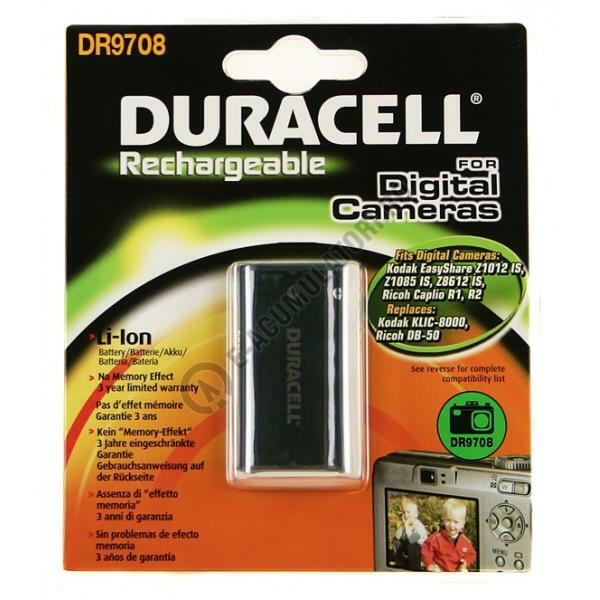 Product Description High quality, original Duracell DR9708 rechargeable digital camera battery. Duracell digital camera and camcorder batteries are built to the highest possible standards, as you would expect from such a trusted brand and have a 3year limited warranty. Each battery is guaranteed â€˜no memory effectâ€™. Duracell has been powering the needs of people around the world for more than 40 years. Their products serve as the heart of devices that keep people connected, protect their families, entertain them and simplify their increasingly mobile lifestyles. They are the world's leading manufacturer of high-performance alkaline batteries and a recognised leader in advanced battery technologies including lithium, manganese dioxide and zinc air batteries as well as nickel-metal-hydride rechargeable batteries. Duracell's products are designed to give you maximum power. Whatever your power needs, it will last longer with Duracell.